Study, due to be completed in April, disproves widely held view that philanthropic donations from the United States have dropped over economic, political reasons. Donations by U.S. Jews to Israeli nonprofits have doubled during the past 12 years, according to a first-of-its-kind study conducted by professors at Brandeis University. The study, scheduled to be completed in late April, disproves the widely held view by many Israelis that philanthropic donations from the United States have dropped over time due to economic and political reasons. In fact, the study - previewed last week during a hearing by the Knesset Subcommittee for the Relations of Israel with World Jewish Communities - suggests quite the opposite. 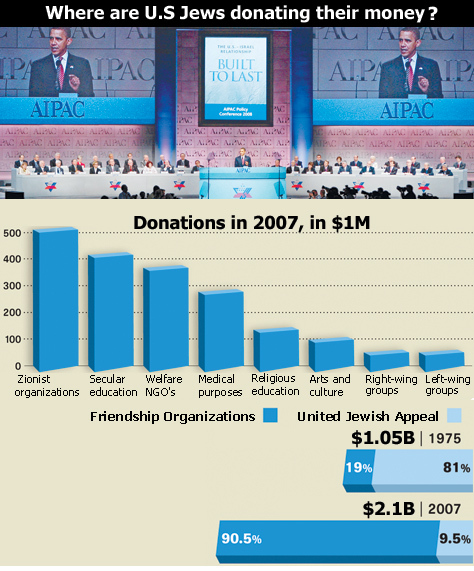 In 2007, various Israeli organizations received $2.1 billion from U.S. donors through the Jewish Agency and various "friendship" associations, according to findings by professors Theodore Sasson and Eric Fleisch, of the Cohen Center of Modern Jewish Studies at Brandeis University in Massachusetts. This is double what U.S. donors contributed 12 years earlier, when only $1.08 billion was raised in the United States for Israeli organizations. "Most of the income of the leading organizations in Israel increased also when adjusted for inflation," Professor Sasson said in an interview with Haaretz. There has also been an increase in the number of U.S. organizations supporting Israel, he said, with the emergence of some 150 new pro-Israel groups in the United States in the 1990s, and some 280 emerging during the past decade. While the research indicates that there was a 10-25 percent drop in donations during 2008 and 2009 - during the period of severe economic crisis in the United States - it suggests there was a substantial rise in donations in 2010, when the crisis began to subside. "According to the partial data we have on the volume of contributions for 2010, we see that there is a clear rise in the amount of contributions," Sasson said. "Since some of the new organizations who joined did not yet file the data on their contributions, it is not possible to know definitively the size of the increase, but I believe that we will reach the record of 2007." Because of a drop in contributions to the Jewish Agency in recent years, "It was thought that Jews care less about Israel, but the situation suggests that U.S. Jewry is deeply committed to Israel," he said. Sasson says the main reason for the increase in contributions is not necessarily linked with a rise in Zionism, but to the increase in the number of donor collectors and their improved professionalism over the years. "There is also the rise in the number of NGOs and the fact that since 2000 there have been NGOs who raise funds directly and not through the Jewish Agency or the [American Jewish Joint Distribution Committee], as in the past," he said.